Feeding your cat a high-quality cat food supplies her with most of the vitamins and minerals required by the average healthy feline. But just like us humans, sometimes your cat needs a little extra help. Vitamins and supplements help treat and prevent certain feline conditions. Some cats cannot process vitamins and minerals properly due to medical conditions. Others may need a little boost to maintain healthy coats. Supplements give them this boost. Cat owners looking for natural or homeopathic alternatives to conventional medications find supplements helpful. But remember, supplements are not a replacement for visiting your veterinarian. In fact, your veterinarian is your best source for selecting the cat vitamins and supplements best suited for your kitty’s needs. The best way to determine your cat’s supplementary needs is to consult your veterinarian. He or she will help you come up with a dietary plan based on your cat’s overall health. Trying to self-diagnose your kitty is not a good idea. Some supplements can cause more harm than good if given unnecessarily. Here are a list of common cat supplements and vitamins that help treat common conditions to keep your cat healthy. Taurine is an important amino acid. It contains sulfur and assists in the metabolism of fats, and is especially important for cats. Taurine deficiencies lead to dangerous conditions like blindness and a type of heart failure called dilated cardiomyopathy. Most quality cat food has the appropriate supply of taurine. Cat owners who prepare food for their cats, who give their cats a vegetarian or vegan diet, or who feed their cats a raw diet need to be concerned about the amount of taurine in their cat’s diet. A taurine supplement is a good idea for these cats. Consult your vet about appropriate dosages. 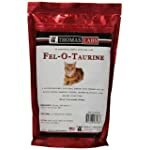 If you’ve already got the recommended dosage and are convinced this is right for your cat, we’d recommend Thomas Labs Fel-O-Taurine. Healthy cats do not typically require Vitamin C. Unhealthy cats are a different story. Cats that are prone to urinary tract infections or bladder stones benefit from a vitamin C supplement. Vitamin C increases the acidity of the urine. This makes it less inhabitable for bacteria and stone creation. Halo makes a nice product if this is something your cat is susceptible to. Another nutrient that can support healthy urinary tract function in cats is cranberry. No big surprise, since we humans often rely on antioxidant-rich cranberry (supplements or juice) to help keep painful UTIs away. Full of proanthocyanidins, cranberry helps prevent some forms of unhealthy bacteria from attaching to tissues within the urinary tract. It also acts as a deodorizer, and may even help reduce the potent ammonia odor of cat urine. In addition to a Vitamin C product, we also recommend Ageless Paws UT Support with cranberry because it also contains n-acetyl glucosamine, bromelain and d-mannose for added urinary tract protection. Cats with a dull coat or dry, flaky skin benefit from fish oil. Fish oil is a great supplement for promoting healthy coats (just like for humans, actually). Plus, cats love it. Check with your vet to rule out major health concerns as dull coats are sometimes a sign of more serious problems. Fish oil makes coats shiny and lustrous. It also helps dry skin maintain moisture. The fatty acids in fish oil assists in the natural processes of your cat’s skin and coat. Cats with dandruff benefit greatly from fish oil supplements. The essential fatty acids in fish oil help more than your cat’s coat, though. Fish oil helps cats with joint problems and reduces inflammation, promotes good claw health, promotes gastrointestinal health and may even help treat allergies. It pretty much rocks. Keep an eye on your cat’s stools while trying to find the right dosage. Loose stools and upset stomachs indicate the dose is too high. Our choice is TerraMax Pro’s premium fish oil. If you’re looking for a chewable Omega 3 supplement, our favorite is from Pawstruck. It’s very affordable and packed with EPA, DHA, and Vitamin E, to support optimal skin and coat health, plus support improved joint and brain function. The pork liver powder adds a flavoring that your kitty will love, too! Vitamin B12 is one of the B-complex vitamins and is often associated with folic acid. B12 is used by the bone marrow to produce red blood cells. Anemia is the result of a vitamin B12 deficiency. Where do cats obtain B12 in a natural diet? B12 is found in organ meats and is present in most cat foods. Ask your vet if you think your cat suffers from anemia and if a B12 supplement can help. You’ll probably have to find this in a more complete option, like a multivitamin. Thiamine, another essential B vitamin, is necessary for healthy brain and nervous system function, as well as energy metabolism. And, as with humans, cats don’t make thiamine, so they need to get it through their diets. Commercial and homemade pet foods can lack adequate amounts of B1, so supplementing with thiamine can help bridge any nutritional gaps. How do you know if your cat is thiamine-deficient? Anxiety is an early sign, followed by weight loss and vomiting. More significant deficiency can cause neurological problems such as seizures. If your cat seems stressed out and exhibits aggressive behaviors, hides a lot, or is not eating, you may want to try a thiamine supplement. Our pick is Ageless Paws’ Calming Chews, because they also contain a Colostrum Calming Complex™ Biopeptide Blend and L-Theanine for additional brain support. Vitamin E is a fat-soluble vitamin found in liver and animal fat. Cat’s with vitamin E deficiencies suffer from a well-documented condition called steatitis. Steatitis, or “yellow fat disease” commonly occurs in cats that are fed a diet primarily of fish. These diets are low in Vitamin E.
The Association of American Feed Control Officials (AAFCO) recommends cat owners supplement their pets’ fish based diets with vitamin E.
This fish oil with added vitamin e has a decent dosage. Carnivorous cats surprisingly do need dietary fiber. Fiber is not an essential nutrient for cats the way it is for herbivores and omnivores, but it does help promote healthy kitty colons. Fiber alleviates diarrhea and constipation. Some of the fiber gets broken down by the intestine to form fatty acids, which help prevent too many harmful bacteria from forming. Metamucil is not going to cut it for your cat. Fiber in cat food is derived from plant material like rice hulls, beet pulp, pectin, bran, and other bean hulls. There are plenty of cat fiber supplements on the market that you can buy for your cat, but we’ve given you our #1 choice below. Fiber is an important factor in managing feline obesity. Fiber adds bulk to your cat’s food without adding too many extra calories. This makes your kitty feel full while she is on her weight loss diet. We found the best way to deliver the extra fiber needed was through these treats, actually: Feline Greenies Smart Bites. Cats enjoy basking in the sun. This is part of the process of converting vitamin D into a usable form. Vitamin D is affectionately called the “sunshine vitamin”, which is converted into an active form in the outer skin layers. This conversion process is insufficient for cats and dogs. They require vitamin D to be found in their food. Most pet foods contain enough vitamin D for the average cat. Vitamin D regulates calcium and phosphorous levels in the bloodstream and so helps your cat form bones and control nerves and muscles. Kittens need vitamin D supplements more than adults. Check your kitten’s food to see if your kitten is getting enough vitamin D. Consult your vet about proper dosages of additional supplements. A number of cat owners have turned to Rx for Pets D3 drops, as it contains an appropriate amount of Vitamin D, typically. Cats need iron for the same reasons people require iron. It is essential for healthy blood. Iron deficiencies lead to anemia. Deficiencies can be caused by parasites, intestinal bleeding, kidney disease, hemorrhagic disorders, urinary bleeding and insufficient iron in the diet. The severity of the other conditions means that checking with your vet about your cat’s anemia is very important. It is hard to tell if your cat has an iron deficiency. The best way is to consult your veterinarian. Your cat may appear weak and lethargic and may behave differently than normal. Introduce an iron supplement into your cat’s diet once your vet has approved an iron supplement for your cat. This handy liquid supplement contains 48mg of iron specifically meant for your cat. Lysine supplements are most commonly given to cats with feline herpes. Cat herpes is different from the main form of herpes we hear about most often that is associated with people. It is not an STD. It is an upper respiratory illness that causes sneezing, nasal discharge, and eye infections. It is also highly contagious. Households with an infected cat should warn guests not to bring their cats into the home. If one cat in your home has herpes, then the odds of other cats contracting the viral infection are high. Lysine boosts your cat’s immune response to help them fight off and prevent herpes infections. Lysine comes in the form of gel, powder and treats. Treat all cats in your home with a Lysine supplement if you have a feline herpes outbreak. VetriScience has a nice high quality Lysine supplement to keep your pets’ immune systems up to snuff. Potassium requirements should be met by your cat’s food unless your cat suffers from a specific potassium deficiency. Some cats are unable to retain enough potassium. Cats with chronic diarrhea and vomiting, kidney disease or other illnesses that cause a potassium deficiency need potassium supplements. Enzymes, muscles, and nerves rely on potassium for proper function. Potassium also maintains your cat’s fluid balance throughout her body. Talk to your vet about the best potassium supplement if your cat suffers from a potassium deficiency. Aging cats and cats with arthritis and other joint problems need a little extra help. Glucosamine supplements are an excellent choice. They help with pain, and they rehabilitate damaged cartilage. The nutrient compounds in these supplements reduce inflammation in the joints. Joint supplements do not have the damaging side effects of most non-steroidal anti-inflammatory drugs (NSAIDS) and can be given over extended periods of time. Cats’ joints deteriorate with age, just like ours. Consider starting your senior cat on a joint supplement as a preventative measure. Cosequin is the gold standard here when it comes to feline joint health. Cat vitamins are available online, in pet stores and from your veterinarian. We actually prefer to order everything online at either Chewy.com (where you can get 20% off your first auto-ship order) or Amazon (unless we’re near a pet store and can’t help ourselves!). It’s just that there is basically endless selection, sales all the time, and with our Prime membership, we get 2 day free shipping, so yeah why not? Remember to consult your veterinarian about your cat’s supplements before giving them. Attempting to treat your cat at home can result in dangerous misdiagnoses. It is easy to overlook a serious medical condition if you are not a trained veterinarian. Preventative care includes both regular visits to the veterinarian and appropriate vitamins and supplements. Research any drug interactions between supplements and your cat’s existing medications. Stop giving the supplements if your cat shows signs of illness or stomach upset like constipation, vomiting or diarrhea. Remember, we’re not vets or doctors, and the information above is simply what we’ve learned through our research. Please take it as information and our opinion, rather than indisputable medical scientific fact. Cats need vitamins just like people do. It is your job to provide your cat with supplements when your cat can’t get all of her vitamins from her food. A healthy diet complete with necessary supplements helps your cat live a long and healthy life. Avoid unnecessary dietary supplements for your cat. Most are harmless, but some can cause side effects. My 8 yr old cat has liver desease. Which vitamins help the most with this condition. And which foods as well. Please be specific and not general. Thank you kindly.